American senator payload specialist astronaut 1984-1985. Status: Inactive; Active 1984-1985. Born: 1932-10-12. Spaceflights: 1 . Total time in space: 7.00 days. Birth Place: Richfield, Utah. PERSONAL DATA: Born in Richfield, Utah, on October 12, 1932. Married. Seven children and one grandchild. EDUCATION: Attended the University of Utah, where he received a bachelor of science degree in business and finance. EXPERIENCE: Senator Garn is a former insurance executive. He served in the U.S. Navy as a pilot. He also served in the Utah Air National Guard as a pilot and retired as a full Colonel in April 1979. He has flown more than 10,000 hours in military and private civilian aircraft. Prior to his election to the Senate in 1974, Senator Garn served on the Salt Lake City Commission for 4 years and was elected Mayor in 1971. He was active in the Utah League of Cities and Towns and served as President in 1972. In 1974, he was First Vice President of the Nation l League of Cities and served as Honorary President in 1975. Senator Garn was elected to a second term in the Senate in November 1980. He received 74% of the vote, the largest victory in a statewide race in Utah history. Senator Garn is chairman of the Senate Banking, Housing, and Urban Affairs Committee and serves on three subcommittees: Housing and Urban Affairs, Financial Institutions, and International Finance and Monetary Policy. The senior Utah Senator also is a member of the Senate Appropriations Committee and serves as Chairman of the HUD-Independent Agencies Subcommittee. He serves on four other Appropriations subcommittees: Energy and Water Resources, Defense, Military Construction, and Interior. Senator Garn served as a member of the Republican leadership from 1979 to 1984 as Secretary of the Republican Conference. SPACE FLIGHT EXPERIENCE: Senator Garn flew as a payload specialist on STS-51D Discovery (April 12-19, 1985). STS-51D was launched from and returned to land at the Kennedy Space Center, Florida. It's primary objective was to deploy two communications satellites, and to perform electrophoresis and echocardiograph operations in space in addition to a number of other experiments. At the conclusion of the mission, Senator Garn had traveled over 2.5 million miles in 108 Earth orbits, logging over 167 hours in space. Senator Garn is the first member of congress to fly in space. BIRHPLACE AND DATE: Jake Garn was born in Richfield, Utah, on 12 October 1932. EDUCATION: Garn graduated from the University of Utah in 1955 with a Bachelor of Science degree in Business and Finance. MARITAL STATUS: In 1957 he married the late Hazel Thompson, and they had four children--Jake, Jr.; Susan; Ellen; and Jeffrey--before her death. In 1977 he married Kathleen Brewerton, who had a son, Brook, from a previous marriage. The couple also had a son, Matthew, and a daughter, Jennifer. EXPERIENCE: Garn served in the U.S. Navy on active duty from June 1956 to January 1960, and he was designated a naval aviator in 1957. He was in the Naval Reserve from 1960 to 1962, and in the Utah Air National Guard from 1963 to 1979. He retired and was promoted to the rank of Brigadier General in 1985. Garn entered politics and was elected to the Salt Lake City Commission in 1967. He was elected mayor of Salt Lake City in 1971 and to the U.S. Senate in 1974 as a Republican. He served as chairman of the Senate Banking, Housing and Urban Affairs Committee and as a member of the Senate Appropriations Committee, the Senate Energy and Natural Resources Committee, and the Senate Rules Committee. He was a member of the Senate Select Committee on Intelligence, and served as Secretary of the Republican Conference. Garn fought against the Equal Rights Amendment and the SALT II Treaty. He sponsored the 1982 Garn St. Germain Act, which significantly restructured the nation's banking laws. In 1985, he succeeded in passing legislation to punish companies which allow sensitive technology to end up in the hands of U.S. adversaries. In April 1985 Garn became the first public official to travel in space when he served as a payload specialist on the space shuttle Discovery (flight 51-D). During the seven day flight, the senator performed various medical tests. The flight landed at Cape Canaveral on 19 April 1985. Garn was reelected to the Senate in 1980, and again to a third term in 1986. Garn retired from the Senate in 1992 to pursue private business and consulting activities. Family: Astronaut. Country: USA. Flights: STS-51-E, STS-51-D. Projects: STS. Bibliography: 5419. 1932 October 12 - . Birth of Edwin Jacob 'Jake' Garn - . Nation: USA. Related Persons: Garn. 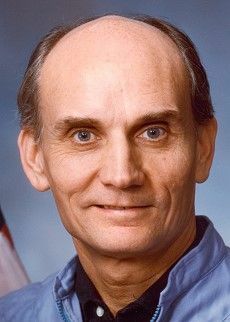 American senator payload specialist astronaut 1984-1985. 1 spaceflight, 7.0 days in space. Flew to orbit on STS-51D (1985)..